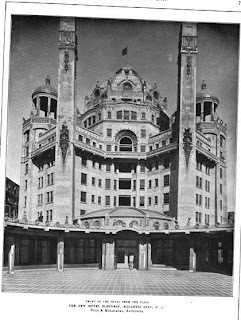 The Blenheim Hotel addition to the Marlborough Hotel designed by Price & McLanahan c. 1906 in Atlantic City, New Jersey, creating the Marlborough-Blenheim Hotel. The hotel had been owned by the same family for practically its entire life, sold off in 1977 to Reese Palley who had plans to spend $35 million on renovations. A month later Bally Manufacturing Company of Chicago acquired a 90% interest in the property with plans to spend $50 million on renovations. A little over a year later Bally decided a renovation was too expensive and the entire hotel was demolished and replaced with Bally's Atlantic City. Click HERE for more on the Marlborough-Blenheim Hotel. Photos from The Brickbuilder, 1906. The Marlborough-Blenheim was the hotel favored by Helen Gould Shepard, ( Mrs. Finley J. Shepard ) Jay Gould's daughter, for her annual winter vacation, It coincided with her wedding anniversary celebrations on January twenty-second. 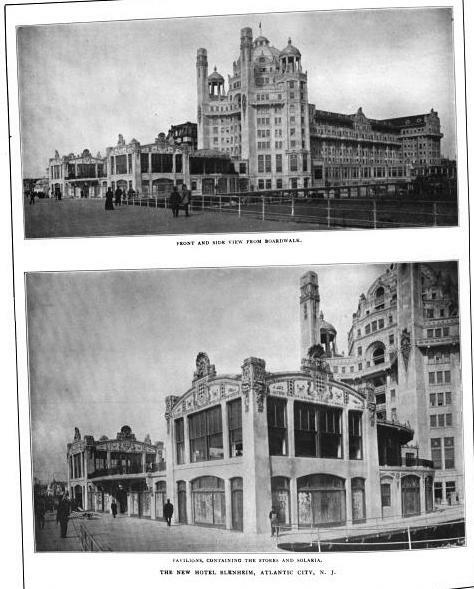 These winter trips to Atlantic City were described by her daughter-in-law, Celest Andrews Seton, in her book, "Helen Gould Was My Mother-In-Law", published by the Thomas Y. Crowell Co. in 1953. The chapter headed "Southward Bound", covers the excursion in detail. A feast of architectural fantasy for the eyes. 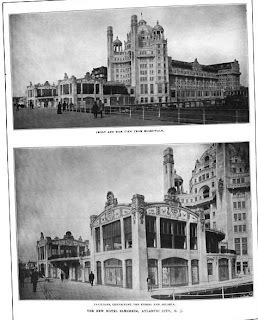 What an incredible building and what idiots to take the wrecking ball to this place back when Atlntic City was first building casinos. Puts all the new fiberglass wannabee exotic hotels, aka Taj Mahal, Ceasars, etc. to complete shame. The incorporation of seashore elements, shells, seahorses and the like into the detailing was stupendous. Atlantic City lost it's crown jewel. Quote more or less "we won't be judged by what we build, but by what we destroy" so sadly true. Both of you are cruel and EVIL. Those videos just are a lasting record of man's stupidity and our senseless destruction. Ancient, disregard my earlier missive. What a splendidiferous wondrous thing, this hotel was---exotic dreams on the boardwalk. I'm glad I got to see it on my long ago and only trip to Atlantic City. It really was one of the high points. One wishes the Bally corporation had been in the mood for a trophy project, but I suppose the economics just didn't work. PS OGD, can't tell you how enchanted I am that Atlantic City was Helen Gould's idea of a winter vacation. I have been fortunate to have enjoyed for the last 20 years a stained glass window from the old Blenheim that I purchased from an antique dealer at the Scotts antique market in Atl. Ga. It is a large window with the center being the three ships Columbus sailed to America. 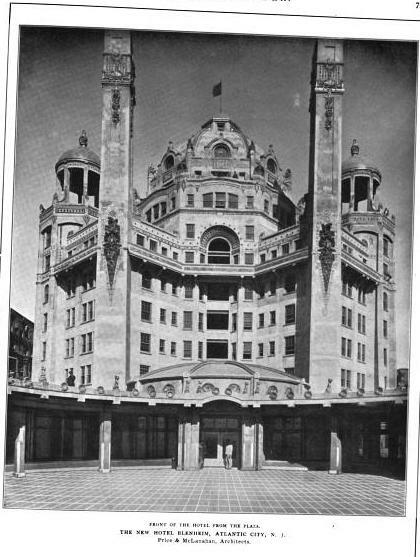 The dealer removed it from the main office in 1976 before the hotel's destruction. I would love to know who produced the windows. As a frequent young vacationer to the MB with my family, I will never forget the beauty, charm and character of the property and its guests. An era that will never be seen or experienced again with today's crude crowd of gamblers, et al. There was another addition to the MB site known as the Ocean Wing. A newer type hotel/motel model that added rooms to the inventory, but never possessed the charms of its big brother and sister. What a place for memories of a better time and culture. Never again to be seen . . .